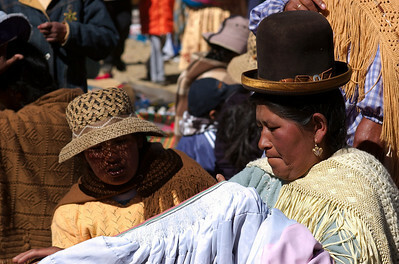 Like many big cities, the most interesting thing to do in La Paz was simply roaming around and watching people's daily activities. 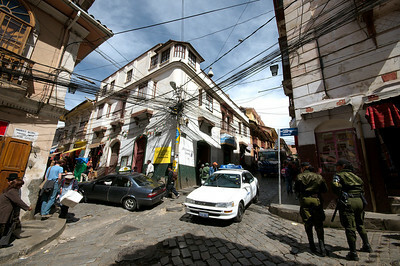 We spent a lot of time walking up and down the steep streets of La Paz dodging the souvenir sellers and attempting to navigate through the downtown traffic (directed not by streetlights, but rather by policemen). 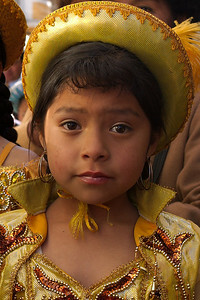 Our opinion of La Paz as a hectic, run-down, crowded city was probably skewed as we never ventured into the richer suburbs of La Paz, where apparently we could have found fancy restaurants and boutiques. The first stop on the tourist circuit is the "Witches Market". Maybe at some point this might have been more of an actual market and less of a bizarre tourist trap, but it now seems to owe its existence to a lucrative trade in tourist kitsch. A few stalls remain that seem to cater to a more local market, selling mainly ingredients for traditional medicine. 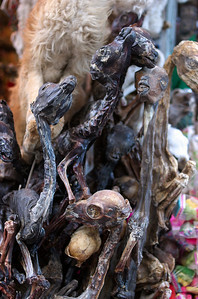 The big tourist draw are the dried llama fetuses displayed on their store fronts. The storekeepers also put together small altars of candies, coca leaves and various other items which can be purchased ready-for-offering. The air surrounding the market is filled with the smell of burning incense, most storekeepers have an urn burning the branches of a local (strong smelling) plant. But even the burning incense can't ward off the overabundance of cheaply-made "Bolivian" souvenirs: "alpaca", "silver" and other "hand-made goods" (not that I didn't drag Yann around for half a day looking for something "original"). The tourist district is centred around the Plaza San Francisco, where we sat and watched street puppeteers, shoe-shine boys, orange juice vendors, and protesters all vying for attention. Most things that we visited were within a few minutes walking distance from the plaza. We spent a morning wandering around the Presidential Palace Plaza, where we bumped into a street procession complete with brass band and costumes, that blocked up traffic for a while (we still haven't figured out what it was all about). 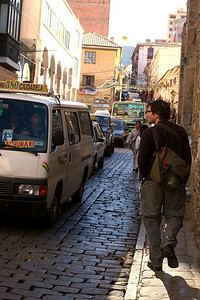 Downtown La Paz seemed to be constantly busy, with the streets packed with people well into the night. 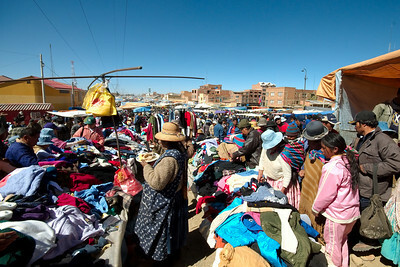 At sunset, street vendors set up their small shops and locals browsed through the various boxes of Chinese made goods. But the number one evening activity seemed to be eating at one of the dozens of "hamburgesa and papas fritas" stands, that opened up after dinner. For 50 cents, you could get yourself a hamburger, buried under a pile of onions, french fries and lots of oil, topped with a squirt of warm mayonnaise and hot sauce. At first we thought it couldn't get any better, but within a few days, I could barely stand the sight of the hamburger stalls, even when they were closed up (later we met a girl who refused to eat any more potatoes, and even picked out pieces of potato from her soup). We never quite got the hang of eating well in La Paz, often by 6pm restaurants were already closing their doors for the evening so we often ended up roaming around looking for something other than a hamburgesa to eat. We were saved for breakfasts and lunches when we found a little restaurant that sold only saltenas, empanadas and coffees! 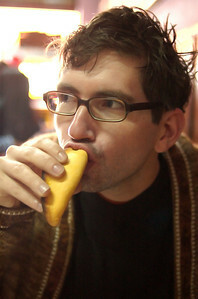 Saltenas are apparently a Bolivian breakfast specialty, they are like an empanada except much juicier. The local saltena eating technique is to bite of the end and then drink out all the juice. Neither Yann nor I could bring ourselves to drink the meaty fillings, we just let them pour all over ourselves. 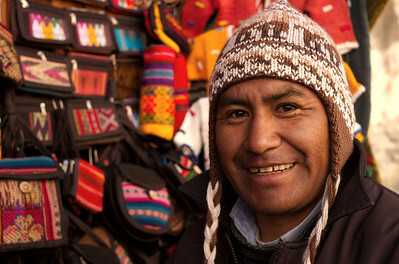 The highlight of our time in La Paz came on Sunday, when we took a taxi up to the neighbouring city of El Alto to visit the weekly market. Sprawling over 24 city blocks, it took us 2 hours to cover just a small fraction of it. Each sector of the market is divided by the items sold there, we managed to see the miscellaneous car parts sector and then wandered through aisles of clothing, electronics, donkeys... before stopping for a break at a soda stall. For the first time since being in Bolivia, it seemed that there wasn't another tourist in sight and nobody could have cared less that we were there.